When we moved into our house ten years ago the back garden was completely derelict save for a patchy lawn and a pathway beaten in by neighbourhood cats! It looked completely uninviting! 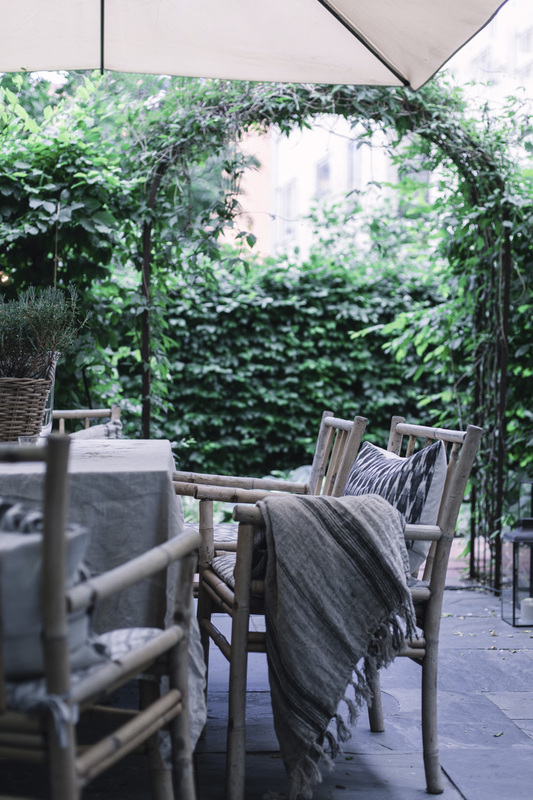 I have to confess, the English girl in me has always pined for a big garden which I could fill with plants and flowers - so I was a little sceptical about this aspect of the house. Over time though, we've slowly chipped away at it - pulling up the grass, adding climbers and perennials and lots of garden furniture. 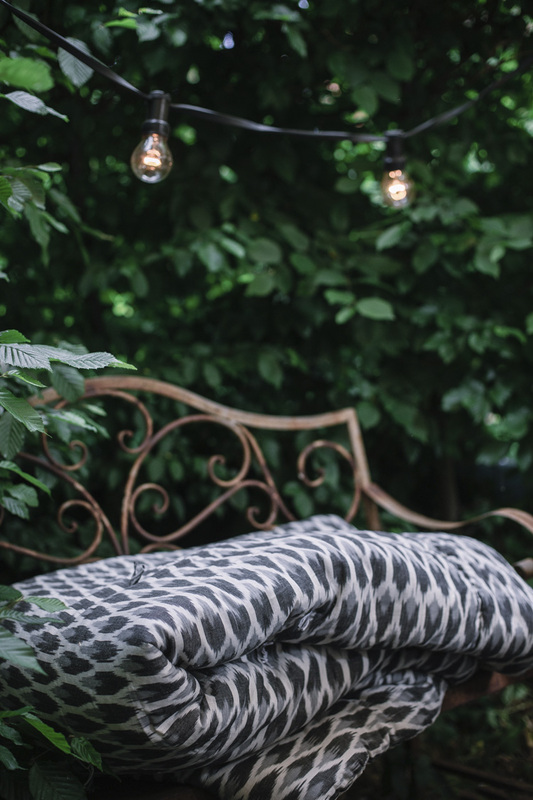 And then this week, we spiced it up with a load of cosy pillows, blankets, lanterns and other accessories courtesy of my wonderful sponsor, Danish homeware brand Nordal. It feels so much cosier now. I snapped a few pictures to share with you. I hope you like it as much as we do! One of things I love the most is the brown rust archway from a local garden centre - we had to remove a section of the beech hedge to fit it in but the space immediately felt bigger. 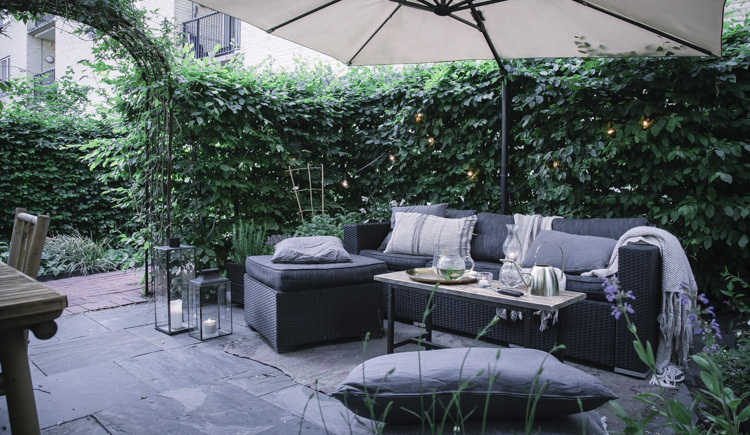 A large umbrella also helped to create a more intimate feel, especially since our garden is overlooked. 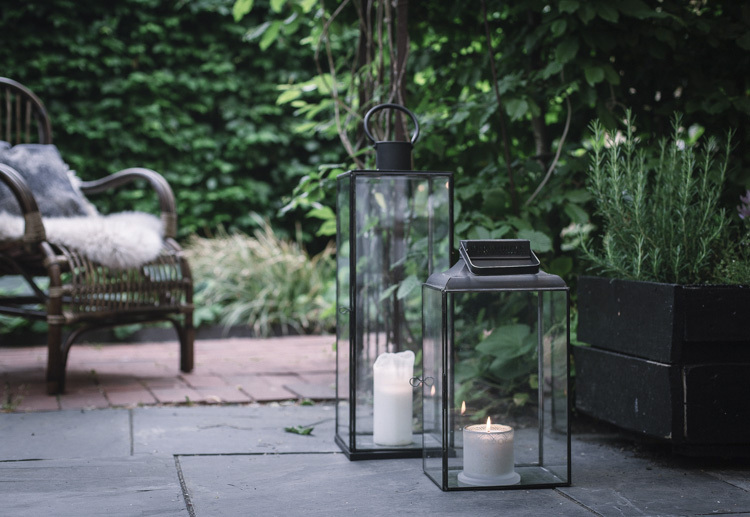 I love lanterns, they help to light up the plants and flowers after dark and make a back yard feel extra mysigt (plus they're perfect when Malmö is such a windy place to live!). 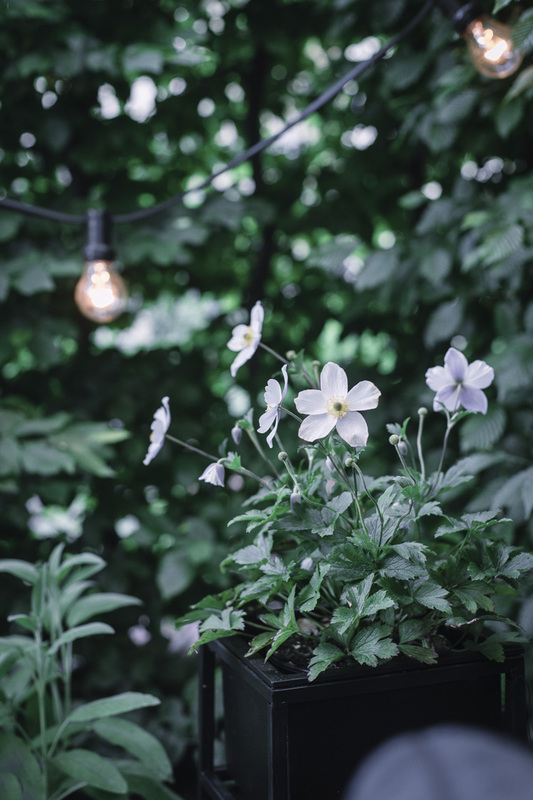 Since the garden is surrounded by hedges, the only way to add flowers such as these Anemones was to use makeshift flower boxes and plant pots. I've also got some pretty, terracotta pots (see further down) which I found at a local nursery. 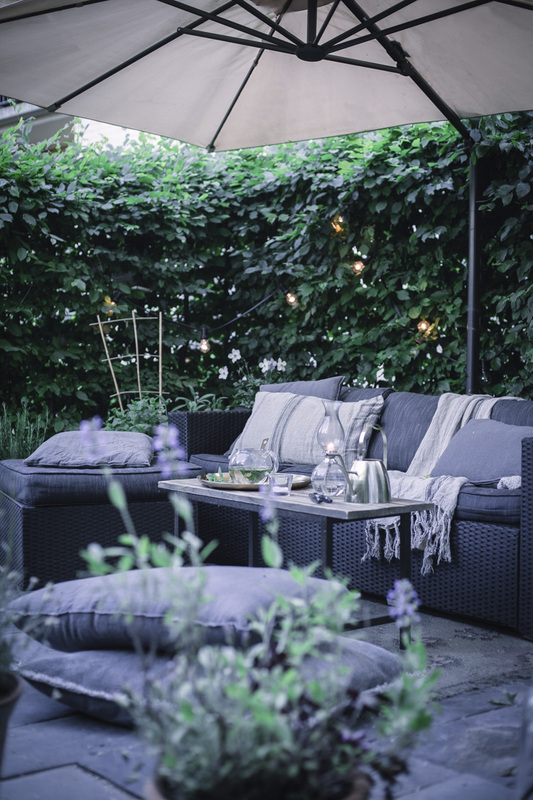 We picked up the L-shaped sofa a few years ago in a garage sale (search for 'black rattan outdoor sofas' and I'm sure you can find a similar one) - it's soooo comfortable! And even more so after throwing in a load of linen cushions and blankets. The girls like to chill on the floor cushions! I planted some mojito mint a few months ago and it's gone completely wild - which means cocktails galore around here - and even some left over to make tea. 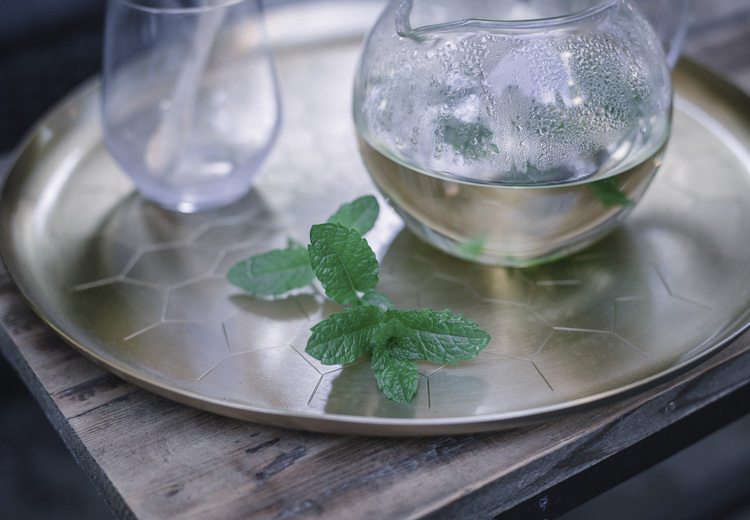 The brass tray is from Nordal. 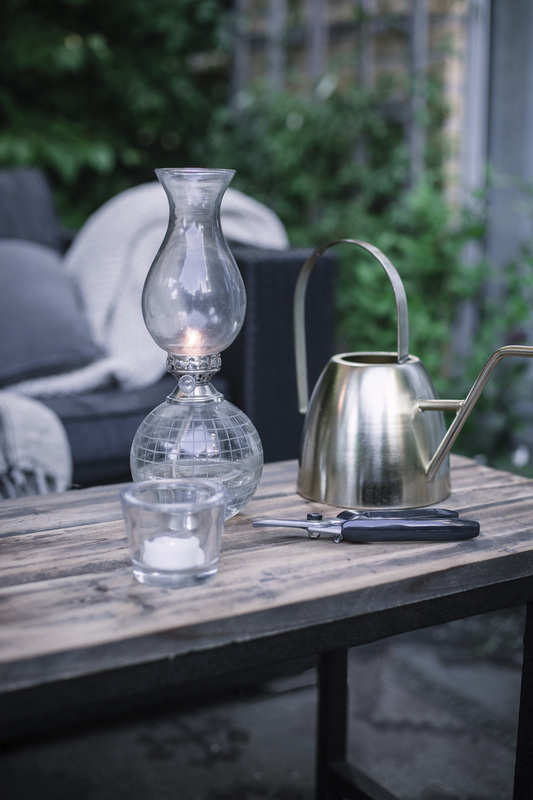 Often oil lamps are a way better route to take in the garden than candles since they shelter the flame and can be refilled. Underneath the table is a kilim rug which I found in my Danish neighbour's garage (thank you Daphne!) - I love it but sadly it's not outdoor-proof so it'll need to be taken indoors when the rain comes down (read: often!). I love the patina on old terracotta pots. 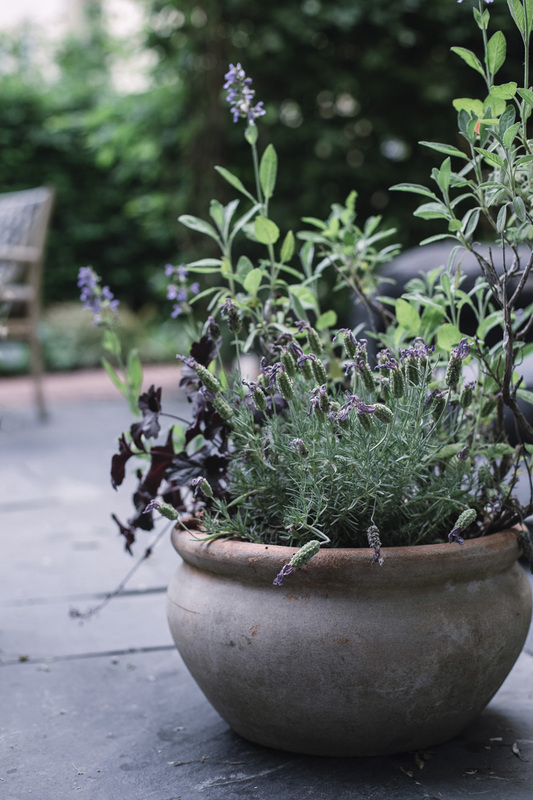 This is one of my favourites (I've had it for years, it's perfect for lavender and salvia! Right. 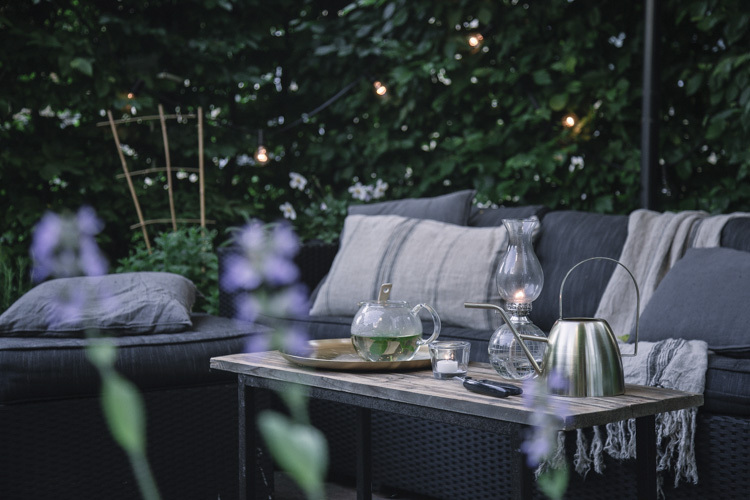 I have to confess - bamboo isn't the best outdoor furniture choice for Sweden (if you live in a wonderful consistently warm clime you're way better off!). BUT it does look pretty we thought we'd give it a go and enjoy it while it lasts (to make it go that little bit further we throw it into storage over the winter) - we bought this set a few years ago but there are lots of beautiful sets online! 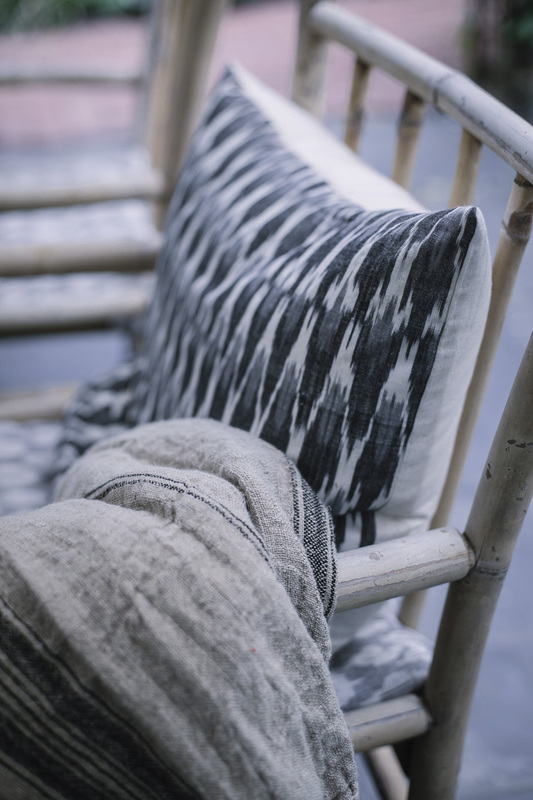 The linen blanket and chair cushions are both Nordal. My Mother gave the antique bench to me as a present years ago - sadly it's so rusty these days that it's not really possible to sit on it, but I couldn't bear to part with it so it now functions as somewhere to store extra blankets and plants. 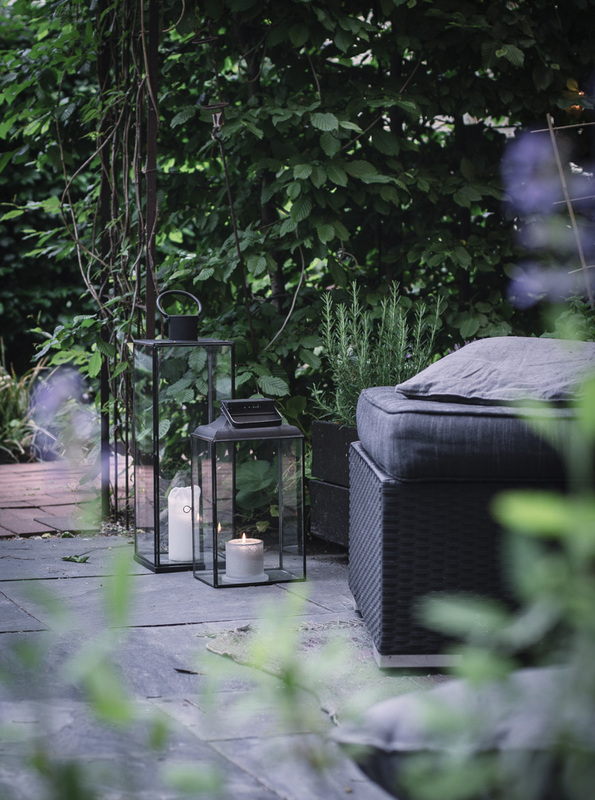 The string lights really add that final touch in the evenings - and they're so subtle too! I found these in town, and I know there are a load on places like Etsy. I hope you enjoyed the tour! It's not a big space, but we think it's a super cosy place for the family to hang out in! If you're curious about anything else you've seen just give me a shout in the comment section below, I'd be more than happy to help! This make-over was made possible with the help of Nordal. All design, styling and words are my own and I only ever work with brands I love and think you will too. Thank you for supporting the companies that make fresh content possible. Thank you! We never thought we could transform this tiny overlooked back yard into this, just goes to show! Lovely. Great place to enjoy a morning coffee! It looks amazing Niki! So green and lush. A beautiful garden, as the summer is approaching, I am also thinking about changing the arrangement, I have some ideas, but I am still looking for inspiration, I hope that it will come out just like you. In such a climatic place you can sit in the evenings every day :) I also want to create such a place at home. I can not wait for it to come out. I’m sure you’ll feel inspired soon and you’ll be so happy once you’ve made the update! It looks so lovely! And that bench is beautiful, I would give it a quick sand down, you can buy a piece to use with your drill, for instance, just to get loose pieces off, and then paint or spray paint with Hammerite. I have done this with other rusty pieces of metal, and it works really well. RITA/TURTLEDESIGN.....I'm soooo glad you mention the life-giving/reviving treatment for such a lovely, still beautiful, and useful bench. I'm really happy with the advice too - will definitely set to work on that! I love this! So beautiful. We have a small city garden that is such a wonderful oasis in the summer months. 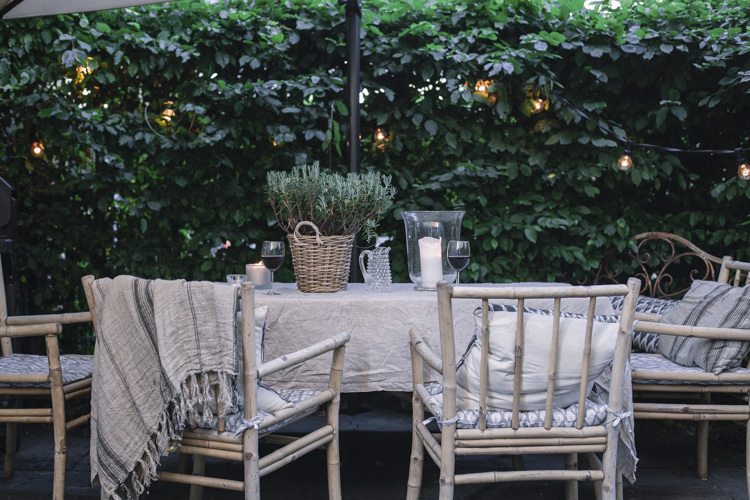 We redesigned our deck space which had led to simplifyng the garden - one of my goals since the place was a jungle! We also started with a patch of grass and a path through it, with no character at all, and I love what we've created. What do you do with all the pillows though? We have to store ours when we're not out there - rain, squirrels, raccoons can cause damage. Your back garden sounds lovely too! The cushions are tricky I have to say - right now we all have to race outside when we notice it's raining (always a little too late) and then we chuck them under the stairs. Not ideal, but worth it over the summer months! lovely. may I ask what is your hedge material? i am looking for an easy to tame hedge for an urban garden. thanks. Thanks Paula. The hedge is Beech. It has leaves from around April to October here which does the trick since we're not out there in the winter months much. So pretty and inviting! Thanks for sharing! This is so elegant. 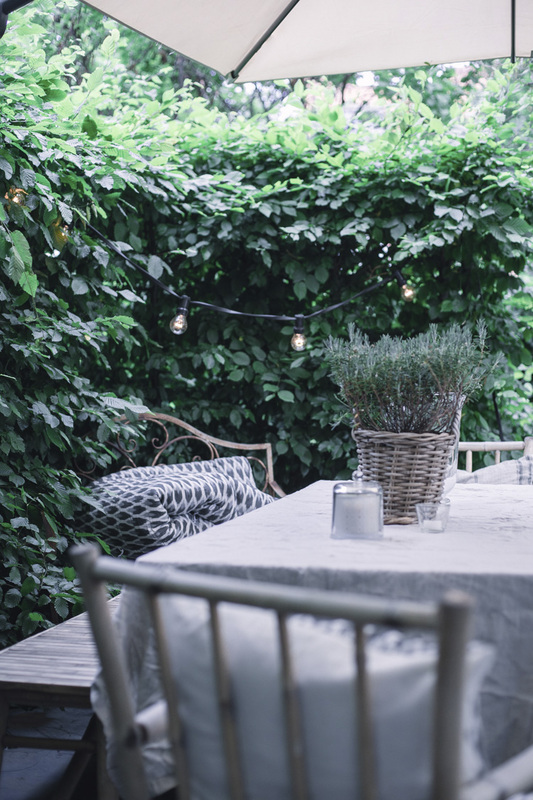 I love the way the greenery looks against the string lights and neutral colors. Pretty! I love that green. Very beautiful and nice, elegantly! Your home is just stunning. I love all your posts and inspiration!